As I mentioned in part 1, there is so much to talk about I have to do it in separate posts. 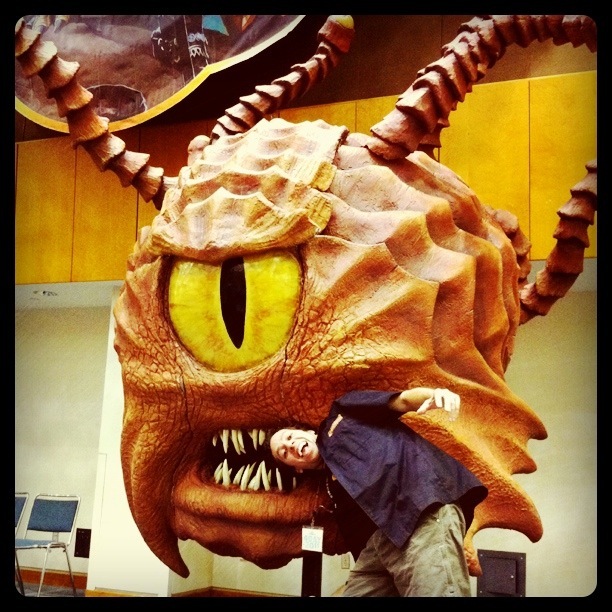 In this post I want to talk about why I can’t comprehend a life where would not visit Gen Con each and every year. My first Gen Con was in 2005. I was introduced to Gen Con by my Washington DC-based RPGA Living Greyhawk group, the adventuring company known as Gryphon’s Wrath. Made up of experienced gamers, they visited every year. After hearing their recounts I had to try it out. It was clearly awesome and clearly I needed to attend to achieve some sort of gaming milestone. Nothing really prepares you for being surrounded by thousands of gamers. While PAX is bigger, PAX is a different demographic (tons of young video gamers). This is a massive horde of serious gamers. RPGs, board games, LARPs, CCGs, etc. – tons and tons of people that love their gaming. The horde takes over the downtown, filling every hotel, restaurant, and tavern in a 5-block radius. You walk around and just see gamers. From airport to restaurant to convention hall you hear the sounds of gaming and people talking about games. It is a gamer’s Meca, their true home, their sacred place. 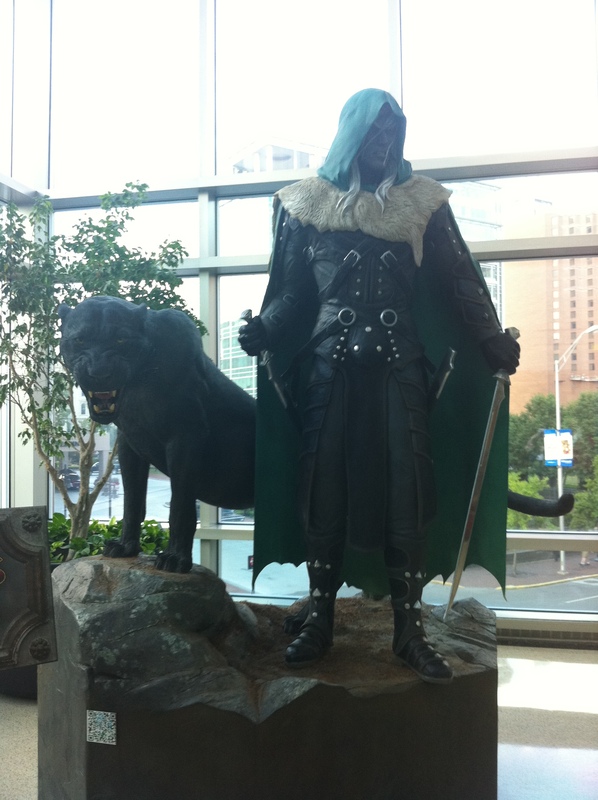 If you haven’t been to Gen Con, and you are serious about games, you owe it to yourself to make the pilgrimage. As my friends write here, you can keep costs down if you plan carefully. The easiest way is to judge for Baldman Games and the organized play hall. Attending Gen Con with a crew of friends, or even just a close friend, is highly recommended. It is really nice to have someone with whom to share a room, eat meals, explore the exhibit hall, and play games. If attending alone, however, you will still have a lot of opportunities to make friends and find mates with similar interests. For me, Gen Con is a yearly get-together with my old Washington DC friends. We reunite in Indy to play our favorite games, trade stories, and recall the way it used to be back when we had no kids and gamed several times every week together. Because these are such great gamers, it is also a chance for me to go a bit deeper with RP and to try out new and different game styles. Gen Con is a great place to try out LARPing, take a board game to a tavern (there is a place that loans out board games, and join a new living campaign. One thing I do little of at Gen Con is interact with friends I have made within RPG companies, the blogging community, the RPGA authoring community, and the online forums. That is something you can certainly do… but I try to keep this con all about my old DC crew. There are many opportunities for rubbing shoulders with gaming gurus, though I personally like D&DXP (a smaller more focused convention) best for getting to meet WotC employees and online personalities. Ashes of Athas: As one of the admins, the weeks before Gen Con were all about hard work and deadlines. We absolutely worked our tails off for this convention, creating the third chapter that closes out the 2011 story arc. The end result is something of which we are really proud. One of the best parts of working on an organized play campaign is seeing how it is received. I ran three sessions of Chapter Three for my DC group and also spent some time watching other tables and speaking to DMs. The reactions to the work truly revitalized me. Shadowrun: My group had little experience with Shadowrun, though I’ve played every edition over the years (some of them very extensively). This is a cyberpunk and magic game currently in its fourth edition. My gaming group finally gave one of the Shadowrun Missions scenarios a shot. I played my Rigger Rocker (drone piloting musician) and everyone else tried pregens (we also had two other guys at the table). We had an absolute blast. The author, interestingly, is a guy we had seen many times at Heroes of Rokugan games. Shadowrun missions have really been of great quality of late. 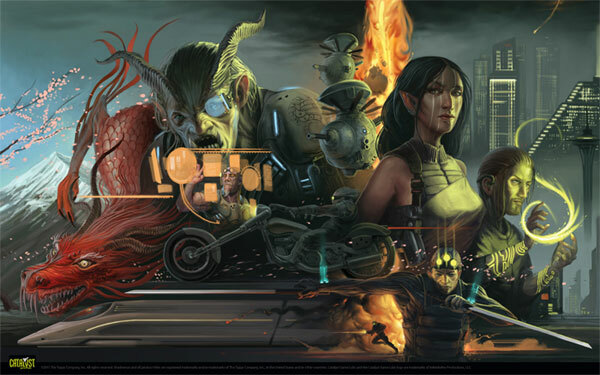 If you like sci-fi and cyberpunk, you should try Shadowrun at least a couple of times. Living Forgotten Realms: LFR keeps getting better. 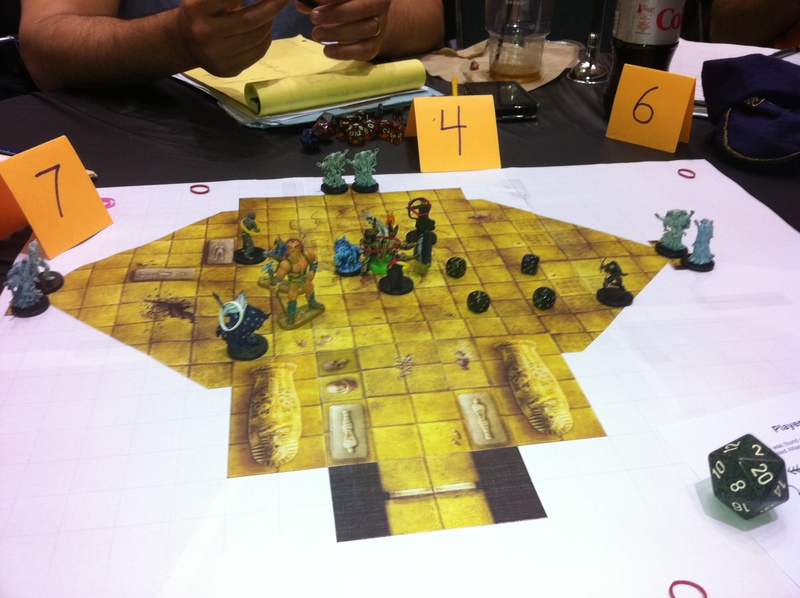 At this con we played the Calimshan series of adventures. This is an Arabian nights type of setting in the Forgotten Realms and the authors (great people I have had the pleasure of gaming and hanging with at other cons) did a great job with the series. I also played SPEC3-3, which had a really dark Cthulu type of feel. All of the adventures had a high challenge level and the players we met at the table were all great. The DM used the map to capture what tasks we were doing around our off-world archeological camp. Mistborn: I really like Crafty Games’ Spycraft game, and one of us was a big fan of the Mistborn novels (Victorian setting with magic gained through consuming metals), so we had high hopes. We weren’t thrilled, to be honest. The scenario seemed good but our DM was rather slow. He hadn’t quite lost us before he listed every one of 30+ rooms in a mansion, but he sure had after. We decided to have a bit of fun. One destroyed mansion later we felt a lot better. The scenario was good, the DM not good, but the rules… hard to say on a first play. Overall we wondered if the mechanic of rolling 5 or so d6s and looking for the highest pair of same-value dice was good enough for an RPG. It seemed to suggest some mechanical limits. We also saw little balance between metal-using and non-metal-using PCs. I think we could give it another shot, especially because we like Crafty Games so much. Free preview/demo book was a nice touch at the demo booth and linked to the actual adventure. Legend of the Five Rings / Heroes of Rokugan: Though I’m more than a bit tired of this game (I loved it for years! ), some of our crew took part in this Asian-styled living campaign. It is a very good RPG and the new living campaign has been well received. I like that each adventure furthers the plot and often changes the balance of power between clans. The dealer’s room is almost a con to itself. You can easily spend two 4-hour convention slots on your first visit to Gen Con, especially if you like a variety of games. All the major companies and a lot of medium and small companies are here selling board games, minis, RPGs, clothing, used and new books, CCGs, collectibles, clothing, software, and more. Even after a handful of years you probably want at least one slot here, with some flexibility in your schedule to come back for more. The experience can be made more enjoyable if you spend some time pre-con figuring out what you want to see, especially new games you might want to demo. When not playing these games, we ate at restaurants, hung out with friends, went to bars, gawked at cosplayers, watched wacky stuff like the pictures below… oh, and tried to get at least 5 hours of sleep a night (up significantly from earlier years!). A couple of our group went to an AEG party (coming home at 4 AM), and those kinds of things can happen if you ask around. 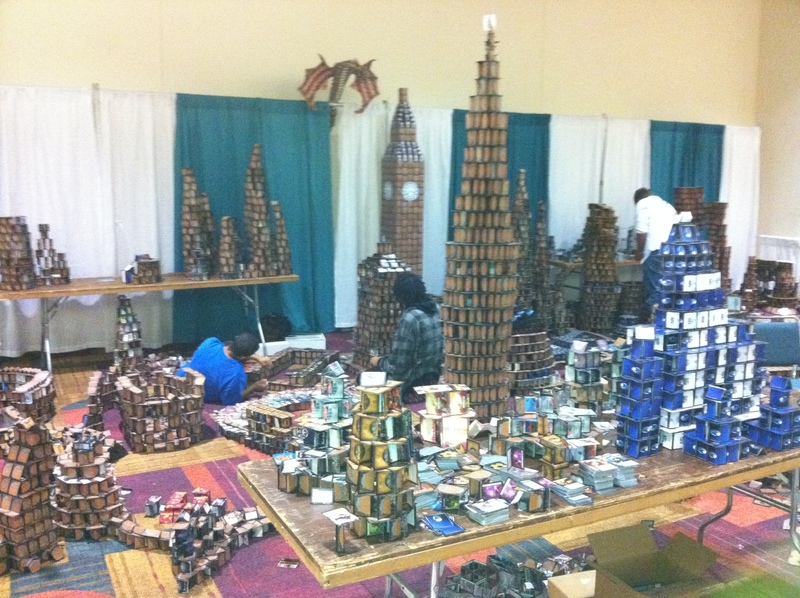 An annual favorite: the towers constructed from the CCGs found in swag bags! 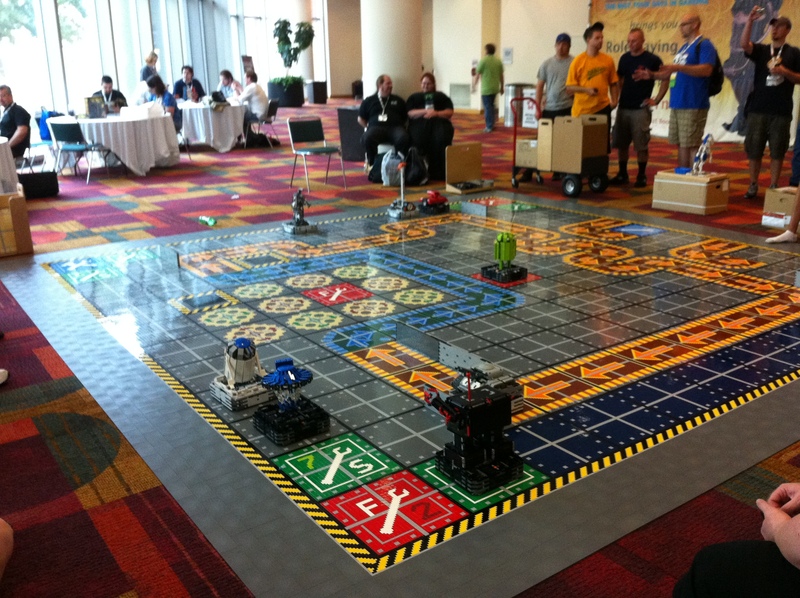 Someone made a huge Robo-Rally game mat with by LEGO Minstorm robots. You actually could play, programing the robots per the board game rules! We usually use the service where you can borrow a board game, but did not do so this year. We also did not do any LARPs this year, though we have in the past. One of our crew has done well with the Settlers of Catan board game, but did not enter the competition this year. Beyond that, there are tons of games to be had. Deadlands, Spycraft, more LFR regions, CCGs, open play… there are just endless types of play we could have tried. 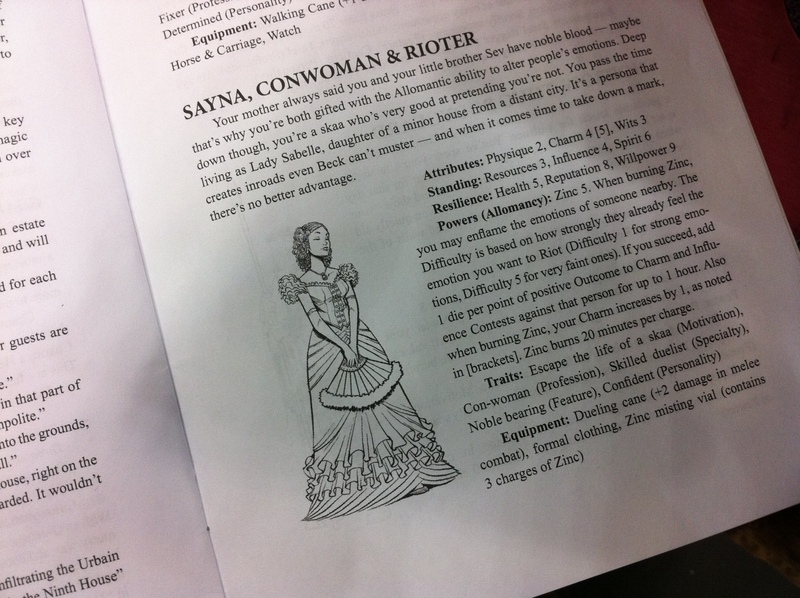 There are also special events like True Dungeon or the puzzles that span the convention. 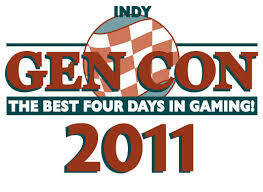 In the end, we did a lot and loved Gen Con 2011! 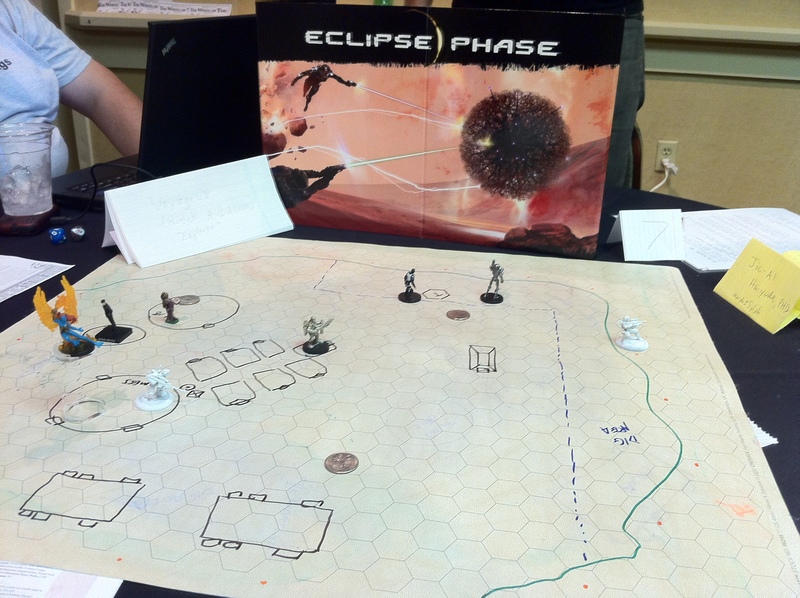 This entry was posted on October 11, 2015 by Alphastream and tagged Ashes of Athas, Conventions, Eclipse Phase, Forgotten Realms, Gen Con, Shadowrun.